There are many manufacturers producing corded beard trimmers. If your choice is the corded ones over the cordless beard trimmers, this should be the perfect one for you. It is powerful, forceful and solid. It is the robust, well-built and muscly device you need for grooming facial hair. 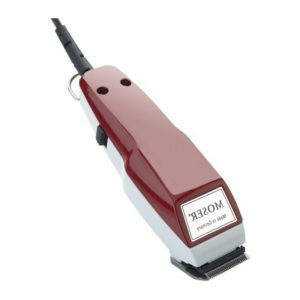 If you are disappointed with your previous corded trimmer or you want a new one that is compelling, Moser 1400-0050 can help. Its design and structure will let you that it is made for professional use. If you are a barber and want to use it on your clients, this can be the right tool for you. It can squarely and precisely trim your beard without any errors. Do not use it on children below eight years or animals. It is for men only. If you want to trim animal hair, purchase separate clippers specially designed for the job. Since it is not waterproof, do not keep it near water. Always disconnect it after your grooming session. It is a strong and heavily built device so taking care of it can make it last for years. The device does not guarantee that it will not get hot if you use it without break. To prevent this, take the plug away and let it rest. Many professional trimmers have the feature of not getting hot. If this is a concern, you should not pick this one. To take care of the tool, wipe off the device using a soft cloth. Do not put anything extra such as solvent. If you are going to keep it away put the blade guard on. If you leave the attachment comb, the length is 0.7mm. You can set it between 0.7 mm to 3 mm. The best part is that it is quiet and does not make any noise. You can lock the length between 0.7mm to 3mm. The attachment comb is 4.5 mm. Let us talk about the design. It has the professional look every barber looks for in their tool. It is a corded one so that means it has a lot of power. It comes with an ergonomic shape that makes it easy to hold. You can easily move around the face and tackle the hair in difficult regions. You can style your facial hair any way you like. The tool is perfect for shaping beard, mustache, sideburns and jawline. This entry was posted in Moser on January 2, 2018 by Professional Beard Trimmer Reviewer.